GRAITEC and AceCAD offer a direct link so that a 3D model done in Advance Steel can be successfully imported in BIMReview and then StruMIS. This movie demonstrates how users may take advantage of this link by exporting the Advance Steel model to a *.gtcx file format and how this fully detailed model is imported and can be viewed & manipulated like any other BIMReview model. As you can see with this movie, GRAITEC Advance Steel is fully BIM compliant allowing easy and seamless data sharing with BIMReview for easy project collaboration. Following our mutual longstanding development work with GRAITEC, AceCad Software is delighted to announce a new model link to the GRAITEC platform. This new model link connection enables the round tripping of information from GRAITEC products into BIM Review and StruM.I.S with feedback into the GRAITEC authoring product. Thus a true circle of information can be completed to the benefit of all in the construction supply chain and facilitates true Building Information Modeling (BIM). This alliance will allow greater flexibility with our mutual clients for data sharing, facilitating amongst many other exciting possibilities – Entity Face Clash Detection and 4D Planning and Progress Feedback with StruM.I.S. Furthermore, this development will offer an easy and adaptable multiple data sharing system enabling significant time savings through labour and error minimization. Established in 1986 AceCad Software Ltd, a member of the international RDS Group is a leading supplier of advanced software solutions to the international construction industry, delivering sustainable and advanced competitive advantages to our valued international clients. AceCad develops a range of software for BIM collaboration, design to construction project management and dedicated steel work fabrication. 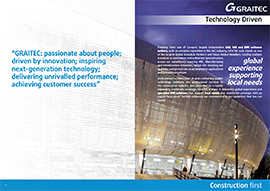 AceCad products have consistently transformed its customers’ business in the construction supply chain. With core business areas in the AEC Building and Construction and Industrial, Process and Plant sectors, AceCad has international operations in ten countries and provides software to customers around the world.